SKU: 0 609408 422324. Category: All, Drama, Music, Released. 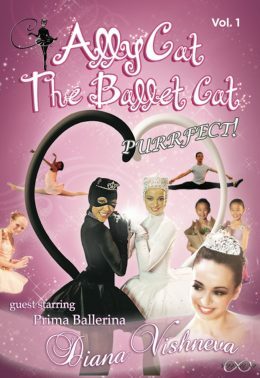 Tags: Ballet, Dance, Princess, Theatre. Dancing ballet is a great way for children to stay fit, help combat childhood obesity and gain confidence. A valuable opportunity for children and parents to learn ballet from Prima Ballerina Diana Vishneva, one of the greatest ballerinas in the world. A living legend. (Similar to learning basketball skills from Kobe Bryant or soccer skills for David Beckham). A timeless, engaging animal character “AllyCat the Ballet Cat” is a superhero for children and dance. The cat characters make the learning process fun, imaginative and entertaining for children. Affordable way for children to learn ballet, a beautiful classical art that improves coordination, mental development and your child’s imagination.